↑ John M. Logsdon (July 6, 2011). "Was the Space Shuttle a Mistake?". MIT Technology Review. p. 2. Retrieved 18 February 2015. ↑ Mike Wall (5 July 2011). 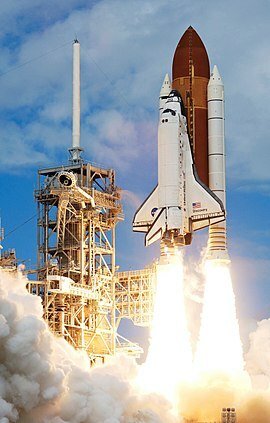 "NASA's Shuttle Program Cost $209 Billion — Was it Worth It?". Space.com. Retrieved 18 February 2015. ↑ Pielke Jr., Roger; Radford Byerly (7 April 2011). "Shuttle programme lifetime cost". Nature. 472 (7341): 38. Bibcode:2011Natur.472...38P. doi:10.1038/472038d. ↑ Woodcock, Gordon R. (1986). Space stations and platforms. Orbit Book co. ISBN 9780894640018. Retrieved 2012-04-17. The present limit on Shuttle landing payload is 14400 kg. (32000 lb). This value applies to payloads intended for landing.